So it looks (allegedly) as if Lewandowsky, having completed the paper for which the approval was sought, submitted an amendment to that same ethics application in order to then use it a second time for a completely different paper. As a result of my recent Freedom of Information request to the University of Western Australia, I have received copies of emails between Prof Lewandowsky and various blogs in connection with the “moon landing denier” paper survey (which I will deal with at a later date), and also the correspondence regarding the application to the university’s Ethics Committee (“EC”). This latter document reveals that the project was substantially altered at the last minute, and the alteration was waved through by the EC in less than 24 hours. This is a long post, so click through to read. Upon completion of the graphical task, subjects will be presented with 3 – 4 questions about their impressions of scientific certainty. For example, people will be asked how certain they think sceintists are about the association between emissions and climate change, HIV and AIDS, and tobacco smoke and lung cancer (using a scale from 0 – 100%). For each item the participants will also provide their own subjective certainty rating (i.e. “how certain are [you] that human emissions [HIV] are largely responsible for climate change [AIDS]”). This section ties in with the questions labelled ConensHIV, ConsensSmoke, ConsensCO2 (in respect of scientific certainty) and CauseHIV, CauseSmoke and the CO2 questions (in respect of subjective rating) in the final survey (here – PDF). However, this is almost an afterthought, something tacked on once the main purpose of the survey was completed – namely the ability of people to extrapolate graphical trends. Members of the population at large as well as the UWA campus community will be approached by the researchers and will be asked to complete a brief questionnaire (5 minutes). No remuneration or compensation will be offered. The researcher will approach potential participants in public places (e.g. City of Perth) and ask if they wish to voluneer 5 minutes of their time. To me this looks like an application for an entirely different survey. One small further point is that in the ethics checklist, one question asks, “Does the research involve active concealment of information from participants and/or planned deception of participants” to which the answer is “NO”. 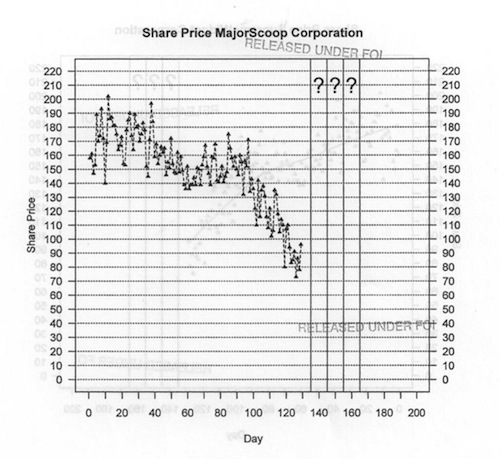 However, section 9 (cited above) shows that some participants will be shown climate data labelled as stock prices. I would have thought that would be regarded as concealing information or planned deception, but I’m not pressing the point. The application and all supporting documentation form the basis of the ethics approval and you must not depart from the research protocol that has been approved. No special conditions were imposed. On 12 August 2010 (Thursday), at 12.07pm (the time is important here), barely a fortnight before the survey was eventually emailed to various blogs, Lewandowsky writes to Kate Kirk, an administrative officer in the Ethics office. She no longer appears in the online directory, but a Google cache provides the necessary information (here – 27 September 2012). The administrative officer in the Human Research Ethics Officer is now Dr Caixia Li. Kate Kirk was apparently still in that role within the last month given the cache date. I won’t speculate on the circumstances surrounding this. UPDATE: Kate Kirk appears on one HREO contact page but not another… odd. She still does not appear in the full staff directory. Dear Kate, I am writing to seek approval for an amendment to the procedure for RA/4/1/4007. In a nutshell, I want to administer the survey not in person but via the internet using professional survey software (e.g. http://www.surveymonkey.com or equivalent. As before, completion of the survey will be taken to constitute consent, and as before a variant of the approved infomration sheet will be shown before the survey commences. (3) In all other respects the approved procedure remains unchanged except that it is administered via internet, with consent again being expressed by completion of the electronic questionnaire. (4) Participants will be recruited by posting links at relevant websites (e.g. http://www.uwa.edu.au/climatescience or science-oriented “blogs”.). There are a number of particularly concerning issues which are raised by this email. “Some further questions” (again, written as almost an afterthought) is actually the 40-plus new questions relating to conspiracy theories and free markets, a subset of which comprise the majority of the final survey as posted on the various blogs. The request contains no amendment to the aims of the project set out in Section 7, nor to the details of the procedures set out in Section 9 (nor even to the project title! ), which no longer reflect the nature of the project and the associated survey, but focuses primarily on the method of administering the survey and the inclusion of “some further questions”. Approval is granted for the amendments outlined in your email and attachments. Hi Kate – wow, thanks for the quick approval. my name alone routinely elicits frothing at the mouth by various people [link to a Jo Nova blog post], not to mention the hate mail I receive. I look forward to receiving the hate mail. I’ll let you know if I get any. What form did the EC review of the request for amendment take? Was it submitted to the whole committee for reevaluation? How was it possible that the EC could have reviewed such substantive changes and come to a decision within 24 hours? Why was there no request from the EC to Lewandowsky to reframe the aims and detailed procedures of the project, which now made little sense? Why was there no request from the EC for an explanation as to the purpose of the conspiracy/market forces questions, which were not addressed at all in the application (either in original form or as amended)? No doubt we will learn more in due course. The application and related correspondence is here – PDF. Lew paper? It now doesn’t even deserve to be used in the homonymic manner, because it is closer to sandpaper; about ISO P12. If a first year student attempted something so pointless you could forgive him if he got the methodology right. In this case I am just appalled that real tax payers money is obviously being squandered on utterly pointless activities. This just tells me that there are too many people mooching in our society. Someone’s gotta keep repeating “What about the students?” in order to remind this august institution what the place is actually there for. Like educating the coming generation about the world in which we live and work, people. Do a great job, don’t they? A great find Simon – just goes to show that when the FOI tree is shaken – you never know what tasty fruit might fall down. The Ethics committee has to check if the research is ethical. The changes that Lewandowski proposed do not seem to be a problem on an ethical. The fact that intent of the amended proposal is not at all like the original, is not something the Ethics committee has to evaluate. That’s more a job for the university or the organisation that granted the money. Good find. I’m impressed by the sharpness and tenacity of your FOI searches. This just shows up their ethics procedure as a joke that seems purely designed to impress by its existence rather than its application. Similar to a lot of the posturing from Lewandowsky and the climate worthies, there is nothing really substantial to them. Truly a sad state of affairs. I’ve reviewed Boy Scout projects that had far better documentation, explanation and methods. Showing charts and implying they are “statistical” results of stock prices is a bizarre undertaking. I’ve studied a number of statistical and empirical past activity derivation graphs for stocks and I’ve yet to see one where even seasoned stock analysts can predict the next movement. At least, not unless they’ve been given a gift of insider information. Still, this is the original core of the survey. No explanation at all is given for dropping this core and substituting different questions. As you point out, the results can not be the same as the original approved survey. A phrase (or two) that I find very interesting are the phrases about hate mail. It seems obvious that hate mail is an expected outcome… Why? Is it Lewandowsky who causes hate mail, or is it certain topics, or perhaps the methods used? Maybe it is the results they manage to grind out of innocuous uncomplicated answers? Anyway, it appears that ‘hate mail’ is a normal discussion phrase; both the anticipation expectation and what appears to be a common understanding of the phrase by UWA staff. Meanwhile, I and I doubt that anyone here understands what is meant by UWA use of “hate mail”. “Frothing”; is that what Lewandowsky means by actual science practice and discussions at JoNova? The really creepy thing for me, as a former long-serving bureaucrat in a government department, is the matey informality of the correspondence in what is ostensibly (and, I presume, legally mandated) formal approval process considered to be sufficiently important by Universities everywhere to justify the establishment of such a formal process designed to prevent just the sort of chicanery that Lewandowsky seems to have indulged in. I hope Dr. Lewandowsky didn’t fund the aforementioned research effort with grant money. If he did the organization who funded this effort might be a tad upset about having the research methodology and focus changed at the last minute. External Grants and Contracts: Australian Research Council (Linkage Grant, with Federal Department of Climate Change and Energy Efficiency). Creating a climate for change: From cognition to consensus. (Ben Newell, Brett Hayes, Marilyn Brewer, Stephan Lewandowsky, Andy Pitman, Matthew England, Chris Mitchell), A$216,000 (plus matching [A$216,000] contribution from DCCEE), 2012- 2014. National Climate Change Adaptation Research Facility. What about me? Factors affecting individual adaptive coping capacity across different population groups. (Kerrie Unsworth, Stephan Lewandowsky, David Morrison, Carmen Lawrence, Sally Russell, Kelly Fielding, Chris Clegg), A$330,000, 2011-2013. Further – the ethics application sates there was no grant funding involved. This was potentially correct at the time of the initial application, however as noted above, this clearly changed and was acknowledged in the paper. What annoys me is that these people are being paid enormous amounts of money for coming up with ridiculous papers on projects which are then amended. I am not a scientist but what I read it seems we have a lot of them writing such nonsense that it is not hard not to think they are wasting millions of dollars trying to make up their minds!!! Of course the good professor gets instant approval for his warmist claptrap. Most of todays acadamia are of the warmist persuaion and the unwritten rule is anything goes as long as it helps the cause. Goodwork Simon . You are shining a light on their sneaky activities them and I bet they don”t like it. Next thing we will hear some bleating from the poor persecuted “scientist” , or a sermon from Malcom Turnbull about not respecting scientists. As an alumnus of UWA (Law Faculty), I am deeply disappointed at the way these so-called “academics” of UWA (and ANU) behave and their arrogant posturing particularly regarding any criticism of their work. Let’s hope it is confined to the Environmental Sciences and not something common to all university staff. I agree the Ethics Committeee only has to check whether the research conforms with the ethics guidelines. It does not have the expertise to check whether the methodology and statistical analysis is correct. That’s something the mate … sorry … “peer reviewer” checks! Lew used a IRB application from one project, to apply for another, with substantially different objectives and study participants. The university process ‘approved’ it. There is no getting away from the above. To me, both parties appear [snip]. Especially considering the lengths researchers and review board members go to in order to conduct research in an ethically acceptable manner, and considering how much trouble researchers face in collecting information and data, in research involving patient data for instance. The professor and his university do not have any regard for the ethics review process. This is borne from their actions. OK – we’re clearly missing something here, which is the guidelines as to how a change to an Ethics Committee decision is made. My guess is (as a University bureaucrat) that Ms Kirk passed this on to the chair of the committee to approve and this was done on the assurance of Professor Lewandowsky that these were not substantive changes – there was not time for circulation or discussion, and I can’t believe the Ethics Committee would allow a functionary to make decisions without consultation. Another FoI would clear this one up. Incidentally, unless Ms Kirk is unprofessional (no evidence for this – she is actually using appropriate levels of formality in my view (when dealing with academics, being friendly rather than over-formal is useful, as most academics believe bureaucrats are a problem)), the lack of a signature file on her emails suggests we do not have the full chain here (many people only have signature files appear on the first email of a chain). I suspect the earlier correspondence is just the original submission, but this may include discussion of what was appropriate to put in. I find this whole episode disturbing. As a long standing member of an ethics committee, my experience is that most of the discussion on a research application is centred on safeguards for the ‘participants’. What other research has this prof done (in his own field of ‘expertise’) where he has completely ignored the ethics mores, as he apparently has on this occasion, and what damage has he done to participants? I daresay that those who participated in this little farce, because of them already taking a stance on a very divisive issue, are big enough and strong enough to survive whatever might come because of their participation. But does prof Lew treat all his research participants with the same degree of disregard? I would think that the UWA ethics committee should do a bit of research of their own and ensure that their have not unwittingly been involved in a monumental mental health disaster that might come back to bite them. I am a PhD student in educational psychology and have published papers on 9/11 conspiracy theorists. I’m troubled by the Internet nature of the survey, but I didn’t find the Lewandowsky paper to be that astounding. The main claim is that belief in conspiracy theories cluster together. This is supported by substantial research findings concerning other types of irrational beliefs. The controversy here seems to be over what kinds of beliefs cluster with climate change beliefs, and particularly with climate change denial activism. Anyone who has been deeply involved in conspiracy theory beliefs knows that activists involved with other kinds of conspiracy beliefs also embrace climate change denial. Perhaps the leading 9/11 conspiracy group – We Are Change – also embraces climate change denial, as well as chemtrails and pretty much every other conspiracy theory. There’s nothing even remotely strange about the idea that climate change deniers could also embrace lunar landing or other types of conspiracy. I would expect it. That doesn’t mean this was a good study. But the conclusions are anything but remarkable.